Paige jeans. Fabletics shirt. Danielle Nicole bag. La Mer watch. Zara heels. It's easy to live in jeans that are so comfortable and chic that you could care less about wearing them for days on end. Paige Denim's new innovative Transcend fabric collection makes it possible to wear these babies to death without dreading the moment our favorite pair of jeans starts to sag - they take comfort to a whole new level, while maintaining the beloved fit and shape. 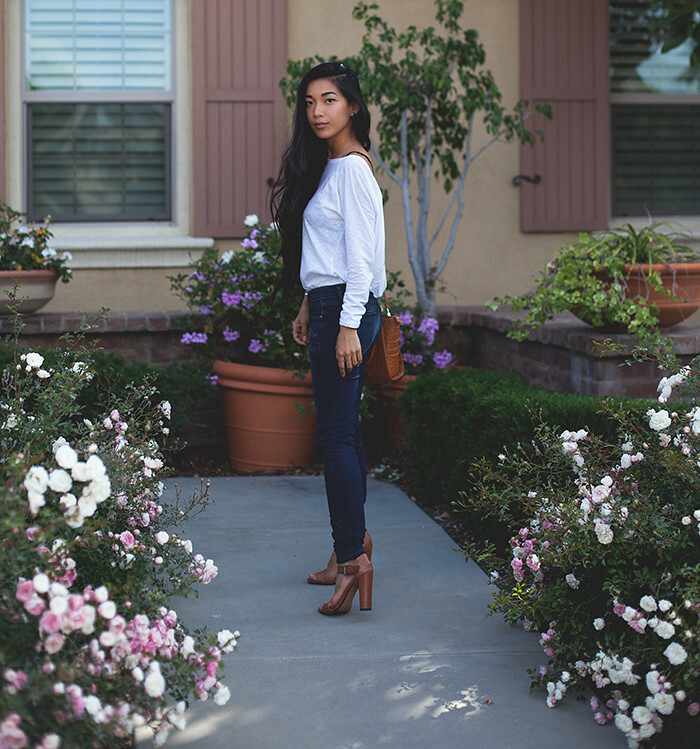 Paige Denim was the first pair of designer jeans I've ever bought and they are an absolute mainstay in my denim wardrobe because of how amazing every jean they have fits to my body. They are one of the few that fits my slightly curvy waist-to-hip ratio without having to walk around with a waist gap. So I'm always excited and genuine in recommending Paige Denim as a valuable premium purchase. You won't regret their denim! Draping tops are my favourite, especially in whites & ivories. Perfect for summer. Also love those jeans, the zip detail is great. Weird question - where can I find that bra/bralette? The back looks so pretty. Lovely look, those jeans has such a nice details! All the flowers! Love the pictures.